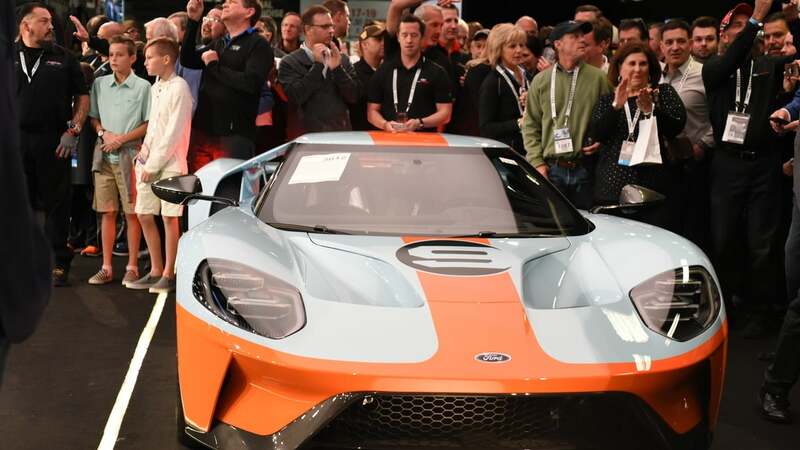 The first 2019 Ford GT Heritage Edition supercar with the famous racing paint scheme sold for a whopping $2.5 million dollars this past weekend with the money all going to help the United Way for Southeastern Michigan. The limited-edition Ford GTs are all highly prized supercars. Typically, potential buyers have to fill out a long application, go through a screening process and agree to certain restrictions to buy the car. For example, buyers have to agree to keep the vehicle for two years and agree to display the vehicle for charity events. None of the restrictions applied to this auction. The buyer can do whatever he wants with the supercar. Rick Hendrick, who owns Hendrick Motorsports, won the bidding. Joe Hinrichs, the president of Ford Global Operations, drove the 2019 Ford GT Heritage Edition VIN 001 onto the auction block. Hinrichs put on a special Ford GT racing jacket and promised it to the buyer to encourage higher bidding. Edsel Ford also promised to make arrangements to have the vehicle delivered to the Ford Executive Garage to make it easier for the winning bidder. The special Gulf Oil paint scheme celebrates the 50th anniversary of the 1968 and 1969 Le Mans-winning GT40 that became one of the most recognizable racecars of all time. The Ford GT40 beat Ferrari 50 years ago to make racing history. The 2019 Ford GT Heritage Edition celebrates the winning race car with the famous paint scheme, along with exposed carbon fiber accents for both the interior and exterior. For 2019 only, the package features the No. 9 graphics on the hood and doors as well as a ghosted image on the interior door panels. The 2019 Ford GT Heritage edition also sports leather seats with special blue and orange stitching. It has polished anodized paddle shifters. On Friday night, the first production 2020 Ford Mustang Shelby GT500 sold for $1.1 million. Ford is donating those proceeds to the JDRF, which raises money to fight Type 1 diabetes. In all, Ford raised $3.6 million for charity at the Barrett-Jackson Auction, in Scottsdale, Arizona.